A leaky roof is always a day ruiner for the homeowner. Best case, you catch the problem early and are able to repair or replace the roof before damage occurs. Worst case, you’ve got rotten plywood in your attic and water dripping inside your home ruining your furniture, ceiling, floors and paint. Now, dealing with an asphalt roof is simple enough. But a slate roof? Well that’s another story. Owning a slate roof is sort of like driving a Land Rover or a Jaguar. Sure, a Chevy is a great vehicle and will get you where you want to go. But if you really want the ultimate driving experience and a car that reflects your status, you opt for the luxury vehicle. Or in this case, the slate roof. And when your Land Rover breaks down (and you know it eventually will), don’t even think about bringing it to the mechanic around the corner. They’ll just gawk at the vehicle and send you to a specialist. Someone who knows how to handle a Land Rover. Slate roofing is the same way. Sure you can talk to any roofer you can find online about slate roofing, and maybe they’ll try to do the job. But there’s a good chance that will end up costing you time, money or both. PROPERLY installing a high quality slate roof is a specialized skill. There’s no other way to put it. Which brings us to the meat of this project summary. The home in this gallery is located in Audubon Park. 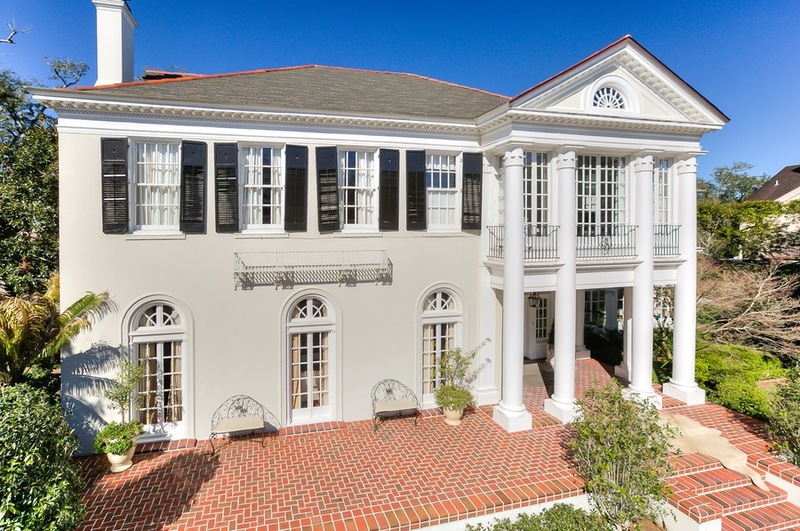 It’s a generational home nestled in one of New Orlean’s most idyllic park settings. The home had an existing slate roof which had finally given out. The underlayment was rotting. The old felt was virtually gone. The roof decking was shot and water was leaking into the home. It’s important to remember that unlike asphalt, a slate roof is not totally waterproof. So having a healthy ice and water shield membrane is critical. The homeowner had called around to a few places. Some of them knew a little bit about slate roofing. Then they found us. 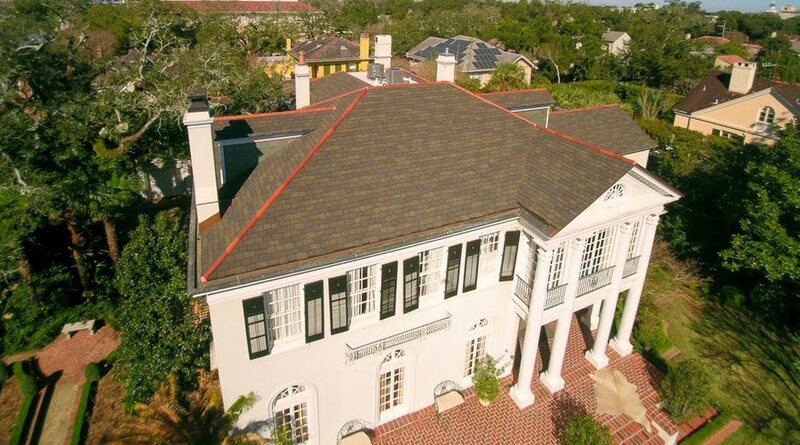 We know EXACTLY what we’re doing when it comes to slate roofing in New Orleans. We explained the process to the homeowner. Gave them a quote. And quickly started the job. After removing the existing roof, we repaired the damaged decking and installed a brand new water shield for the new roof. Then it was time to install the new slate. Many people don’t know that there are a few types of slate you can choose from. You have Chinese slate which is of course cheaper. But let’s just say you get what you pay for. We prefer working with high quality natural slate. It will last up to 50 years if installed properly. And you just can’t beat the color. After all, it was created by Mother Nature herself. The roof on this particular home is Natural vermont slate, quarried in Vermont with an amazing blend of colors. When it’s time to install a slate roof, you don’t just jump on the roof with and nail gun and fire away. Natural slate roofing comes pre-drilled with holes. You nail it down by hand with copper nails. The hard way, but the right way. Luckily for this homeowner, we were able to reuse the terracotta ridge caps which not only saved them significant money but also helped preserve the original look and feel of the roof. We also installed copper flashing around the roof vents and chimney. Did it take awhile? Yes? Was it worth the time and effort? You bet! Thanks to the new high quality roof, this home will retain it’s stately status for up to 50 years thanks to the new roof, barring a natural disaster. If you are in the market for slate roofing or repairs anywhere in metro New Orleans, please contact us today for a free estimate. And whatever you do, don’t trust your slate roof to the guys around the corner who just work on any type of roof.